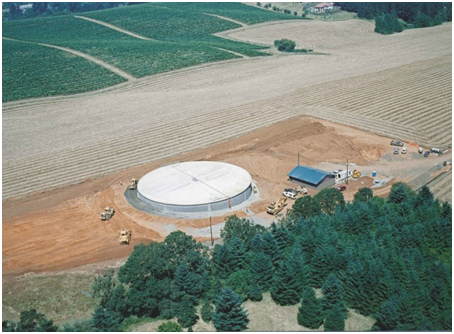 Project Description: This project required the design of a 2.2 million gallon AWWA D110 Type 1 prestressed concrete tank with 22 foot walls and a diameter of 140 feet. In addition to the tank, the project included the design of an access road, yard piping, and an 1800 square foot control building. The control building housed the reservoir control valves and instruments such as a flow meter and chlorine analyzers and the electrical controls. The project included a seismic protection system with seismic monitoring and control equipment to close valves on the reservoir pipelines in response to a seismic event. 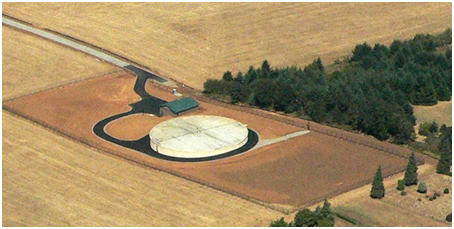 The reservoir site was planned and designed for the future addition of a second tank controlled from the same control building. The anticipated differential settlement was greater than could be tolerated with a conventional six-inch thick, membrane-style, floor slab. Therefore a continuous 24-inch thick floor slab was designed. Westech provided design and construction phase services as well as a full-time inspector for this project.